Keep your dog's paws safe and covered with these Yellow Arctic Winter-Proof Dog Boots. Features: ..
Keep your precious pup's paws safe and covered with Guardian Gear Dog Boots. Features: ..
Keep paws safe from heat, cold, ice, and salt surfaces as well as covered with our Guardian Gear&t.. Your dog will be happy you helped protect his precious paws! These high quality dog boots will kee.. Guardian Gear Weatherized Fleece Boots help to provide protection against Mother Nature’s worst with.. 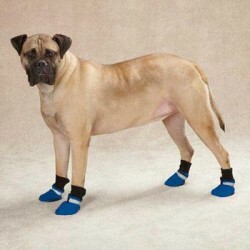 Guardian Gear Weatherized Fleece Boots help provide protection your dog's precious paws against Moth..